Sapporo is now taking orders for a new type of beer brewed with components not of this world. If you thought the science experiments performed in space only involved spacesuit-wearing monkeys and tough math equations, think again. The Japanese arm of Sapporo is now selling beer brewed from hops and barley cultivated in the zero-gravity environment of space for five months. The beer is called Sapporo Space Barley and will be limited to 250 six-packs of 330ml bottles. Its safety has been guaranteed, so it's unlikely to contain a symbiote that would at first give you spider powers and later take over your mind. Each six-pack will run Â¥10,000, or about $110, with Sapporo only taking orders up to December 24, 2009. 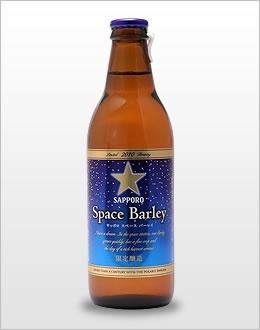 If you're really interested in trying to nab some, try visiting the Japanese Sapporo Space Barley web page. It will apparently be divvied up by lottery. While the idea of space beer seems like a novelty, the reality is that the cultivation of crops in space that can be used to brew beer just like on the surface of Earth is an advancement in scientific research. If humanity ever leaves Earth on giant spaceships, it'd be a disaster if we couldn't eat anything. To some, it'd be even more of a disaster if we also couldn't also get properly crunk.